This recipe came out of a French Food and Wine Magazine that one of the Farmer's Market vendors, Bea, gave me to "read". Bea is a wonderful lady who sells honey, among other items, along with her husband Jean-Claude. She is originally from Paris and has been here for 12 years. I looked at all the pictures in the magazine since I only took high school French and I could only make out a few words on my own! I found this one to try, although there were tons of other recipes that looked great. So with Bea's help, we translated the recipe into English and I converted the grams into cups and this is the result. They came out great, nice and moist. The rhubarb and tarragon is spooned on top with some granulated sugar so when you take a bite, you get all those flavors, plus a little taste of cinnamon. I could have used more tarragon because the flavor wasn't too noticable but I only had a little bit just coming up in my garden. The recipe yielded 8 muffins. One last thing, I had some rhubarb left in the freezer from these so I used that and it came out fine. Preheat oven to 350. Line muffin tins with paper cups. 1. Place flour, baking powder and cinnamon in a small bowl and stir to combine. Set aside. 2. Cut rhubarb into small pieces. 3. Place rhubarb, tarragon and 2 tbsp. sugar into a small saucepan, cover and simmer for 5 minutes. 4. Beat eggs ( I whisked them), in a medium bowl with 1/2 cup sugar. 5. Whisk in melted and cooled butter. 6. Add dry ingredients and stir just to combine. 7. Spoon batter into prepared muffin cups. 8. Spoon the rhubarb/tarragon mixture onto the batter and sprinkle the remaining 2 tbsp. sugar on top. 9. Bake approx. 20 to 25 minutes. Cool on wire rack. I just tasted rhubarb for the first time last year, and I loved it. Now that it's coming back in season I'm excited to try out more recipes with rhubarb. 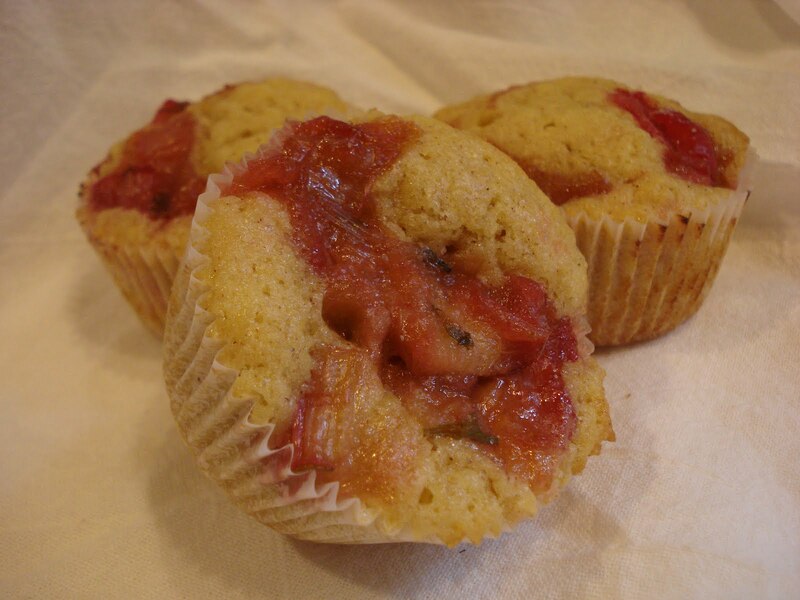 These muffins look really interesting with the rhubarb and tarragon combination. Bea sounds like a lovely lady -- it was so nice of her to share the recipe! And thank you for passing it on! Thanks Jessica. I,too, am so looking forward to more rhubarb this season. It's such a delicious veggie/fruit to bake with. Try the rhubarb lemonade, too..it's so amazing!